Learn first aid online, on your schedule. When you take an online first aid class from the American Red Cross, you can learn the latest skills and techniques for administering care – in a way that won't disrupt your day. Taken entirely online, these courses do not include the opportunity for you to demonstrate skill proficiency to a certified instructor, and therefore may not meet requirements for workplace safety certification. If you must complete a first aid class that allows you to do so, browse our blended Simulation Learning and classroom-based courses. Designed for parents and teachers, adults and teenagers, troop leaders, coaches, and more, our online first aid courses allow you to help those in crisis receive care until medical professionals arrive. In order to make learning proper first aid techniques possible, we've developed online courses that can help you help others in their time of need. To get started, all you need to do is register for a course, then access the materials on a compatible device. (Please read the course description for additional details on compatible devices and/or web browsers.) Once you've registered for a class, you can begin the coursework at any time. For additional flexibility, we've designed all American Red Cross first aid online courses with highly interactive modules, which you can take in virtually any order. This way, you can truly learn your way. Plus, with unlimited two-year access to the course materials, you can take your time getting through class, or complete all of the modules all at once, then revisit the materials and refresh your skills as needed. One week after 17-year-old Reid completed his Red Cross CPR training, he needed to use it. In November 2011, Reid saved the life of Jim Hammer after he collapsed at the recreation center where Reid worked. Now friends, they share their story. For more than a century, we've prepared people to respond to emergencies of all sizes - from the everyday to the large disaster. 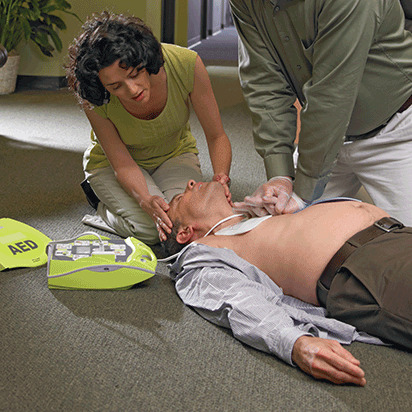 Join the millions we train every year and learn the skills that can save a life. "Without my friend's training, I would not be here"
"I'm really glad she survived that"
Online first aid classes give you the skills you need to respond to a wide range of emergencies – and can help those in need achieve the best possible outcomes. If you're ready to get started, all you need to do is find a class online or in your area. It takes just minutes to register and a few short hours to earn the certification you want.